Hosted by the Gene Siskel Film Center, the month-long Chicago European Union Film Festival (CEUFF) featured 15 films directed by women (15 out of 62 = ~ 25% = a record high for this event). FF2 Media has compiled “Best of the Fest” lists from three Chicago team members, recommending films ranging from food documentaries like Cooking up a Tribute to holiday heartwarmers, A Holy Mess and All the Best. Their Finest. (BKP: 5/5) UK. Screenwriter Gaby Chiappe adapts Lissa Evans novel Their Finest Hour and a Half into the finest hour and a half of the Chicago European Union Film Festival. A romantic dramedy, an underlying feminist message, a period piece in 1940s London: an utterly enjoyable cinematic experience. With men off to fight in World War II, “Catrin” (Gemma Arterton) becomes a screenwriter on a makeshift movie, a project meant to lift the spirits of a mourning country. Welsh Catrin immerses herself in the filmmaking division of the Ministry of Information, befriending snarky head writer “Tom Buckley,” (Sam Claflin) and a crew both humorous and likable talent. Arterton is the witty protagonist unafraid to be feminine and lovelorn, yet unapologetically brave. Her chemistry with the charming Claflin makes Their Finest one of the strongest love stories portrayed in recent film history; a unique, earned and unforgettable. Bill Nighy rounds out the supporting cast in an outstanding comedic role that adds light, humor and welcome reprieve in a wartime setting. Danish director Lone Scherfig captures the movie-within-a-movie with ease, allowing viewers to effortlessly flow along with this heartwarming - and equally heartbreaking - journey. Highly recommended! A Holy Mess. (BKP: 4/5) Also known as: En underbar jävla jul. Sweden. Simon and Oscar, a gay couple who have been together for five years, have chosen to keep their burgeoning family a secret for nearly nine months. Their close friend is pregnant with (one of) their babies and Christmastime is the perfect time to tell their respective families all about their life-changing plans. Despite the stereotypes and Hallmark-channel schmaltz, Director Helena Bergstrom’s A Holy Mess is a comedic look at the painfully awkward family holiday scenarios.This feature-length, diluted version of Modern Family will be relatable to any viewer, especially around the holidays when stress can be at an all-time high. Oscar's temperamental father “Ulf” (Robert Gustafsson) is a standout, portraying the crabby, exasperated traditionalist. An enjoyable comedy from start to finish and a nice reminder that we can all escape family events unscathed. All the Best. (BKP 3.5/5) Also known as: Sve najbolje. Croatia. Ksenija Marinkovic is darkly funny as pastry shop worker “Verica,” desperately wanting a change of pace for Christmas. She and opera singer “Brankica,” (Renata Pokupic) along with Spaniard “Martin” (Ozren Grabaric) find themselves in a Croatian-version of Love Actually, waiting for fate to intertwine their lives. In this drama filled with both holiday spirit and the underlying sadness of the season, Snjezana Tribuson’s All the Best is a human story about finding love and happiness when it seems like an impossibility. King of the Belgians. (BKP: 3/5) Belgium/Netherlands/Bulgaria. 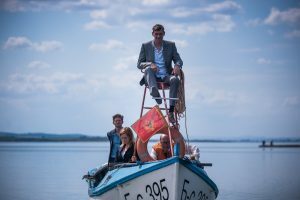 Directors Jessica Woodworth and Peter Brosen’s mockumentary tells the story of a Belgian king on an unexpected road-trip across the Balkans. An electrical storm causes “Nicolas II” (Peter Van den Begin) to extend his Istanbul trip and experience the culture and way of Western European life. “Duncan Lloyd” (Pieter van der Houwen) directs the “documentary,” meant to make the king more relatable to the Belgians, while capturing the misadventures traveling through Turkey and Serbia. Loaded with vivid imagery of various cultures, King of the Belgians is a comedic treat, taking viewers on a journey of unforeseen circumstances and self-reflection. It will make you want to go where he goes, meet the people he meets (particularly the Bulgarian folk singers) and discover what it means to be human. Tonio. (BKP: 3/5) Netherlands. Based on the best-selling novel by A.F. Th. 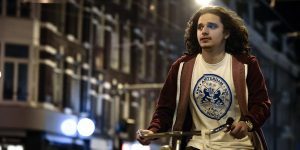 Van der Heijden, Dutch director Paula van der Oest tells the story of two parents coming to terms with the death of their 21-year-old son, “Tonio” (Chris Peters). After being killed in a bicycle accident, Tonio’s novelist father “Adri” (Pierre Bokma) and mother “Mirjam” (Rifka Lodeizen) painfully examine their life through flashbacks and the what-might-have-been, imaginations almost every person can attest to having. Viewers can relate to both the middle-aged protagonists and the young Tonio, a young man who hasn’t quite figured out his dreams. The unique structure of the film cuts back and forth between time periods (and can be difficult to follow at times) but ultimately leaves a message of how a linear life continues in a series of advances and retreats. Cooking up a Tribute. (BKP: 3/5) Spain. 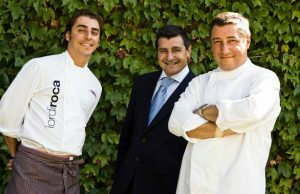 Co-directors Andrea Gomez and Luis Gonzalez follow the journey of a restaurant-on-the-move, El Celler de Can Roca, as they venture on the road moving from Texas to Mexico to Colombia and Peru. The decadent food is the star of the film, outshining the three brothers/main subjects of the film. At times, the repetitive subject matter dags and the confusion as to how these people can afford such an elaborate journey leaves the audience scratching their heads. However, Cooking Up a Tribute will leave you salivating for this extraordinary culinary experience. Ralitza Petrova’s Godless and Laila Pakalnina’s Dawn may be attractive to niche audiences, however, they are not on my personal “Best of the Fest” list. However, Stefan Zweig: Farewell to Europe was well received by others on the FF2 Media team.